Whenever anyone asks what i do for work, it always ends up being an interesting conversation. I have always had an interest in the human brain, but it wasn’t until my Honours year that I was finally able to study the human brain directly. As part of my Honours project, I studied little pieces of cortex from the brains of individuals who had schizophrenia. This interest was only further ignited when my lab partners and I visited our local Brain Bank where we got to learn about how the brains were processed, dissected, anatomically and histologically verified and stored. Postmortem human brain studies allow us to look at molecules like DNA, RNA and proteins directly in the brain – this can’t be done in living patients, which is one of the reasons we are still performing these types of studies instead of implementing one of the imaging approaches that can be done on living humans (e.g. fMRI and PET). Also, because neuropsychiatric disorders are complex conditions with multiple causes, they are extremely challenging to exactly model in vitro or in vivo for molecular studies – this is where postmortem human brain studies come in, as they allow us to identify molecular alterations that can then be followed up in vitro and in vivo, rather than attempting to identify ‘supposed’ alterations in other types of models first. Studying the molecules in the postmortem brain isn’t about getting a whole brain and dissecting it and studying it anatomically like you might see Gunther von Hagens do on the tv show “Anatomy for Beginners”. 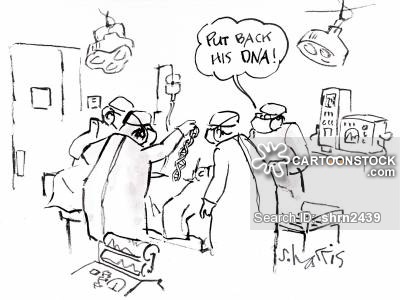 Its also nothing like performing neurosurgery. Of course these tissues still need to be prepared for research, but this is done by pathologists and specialised scientists at the brain banks before it reaches researchers like me. The types of samples that I look at are tiny: only a few milligrams-grams of tissue (no bigger than the size of a pea or the slices below which are about 2cm wide). They usually are mushed up into a liquid in tiny test tubes or are in super thin slices like below, about the size of the tip of my thumb. Human brain microscope slides. 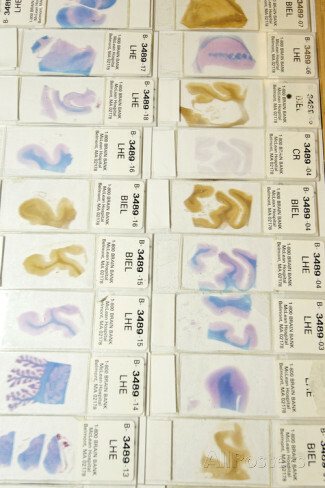 Microscope slides of stained sections of human brain. These slides are from the Harvard Brain and Tissue Resource Centre, USA. This is the largest brain bank in the world. It stores over 3,000 brains, which are available to researchers studying disorders such as Alzheimer’s disease, Parkinson’s disease and schizophrenia. The idea of using the postmortem human brain appeals to me because I find it intriguing that we can examine the makeup of molecules inside the brains of people, and get a pretty good idea of what molecular processes were contributing to their illness. We can also investigate how the changes in a person’s DNA or their life experiences influence the molecules that make up their brain. By doing this type of research, we can find better ways to prevent and treat these illnesses in the future. Until it becomes possible to do this in living human beings, postmortem human brain studies remain unique, intriguing, extremely informative. Postmortem human brain tissues are treated with upmost respect and care, but due to their precious nature, they are a scarce source. If you think you might like to donate your brain to scientific research, you can Google “brain bank donor program” to search for your closest bank (they exist all around the world). If you need help finding the place to inquire about brain donation near you, feel free to contact me. Thank you to all the patients and families who are already part of these programs.